Summary: Flat roofs are less expensive than pitched roofs and will not block second floor windows above. A flat roof has a slight inclination but water runs off freely. Carl, Is building a flat roof style home practical in an area that has a lot of snow and rain in the winter time? And, is the cost of the flat roof more or less than a pitched roof? Hi Tony, Flat roofs are practical in almost any climate if they are properly and professionally installed and maintained. In heavy snow areas, flat roof maintenance may include snow removal if necessary. The weight of the snow on a flat roof is greater than on a pitched roof and the roof structure could fail. I don’t want to get into Physics, but this is due to vector forces. But it is often easier to remove snow from a flat roof than a pitched roof. 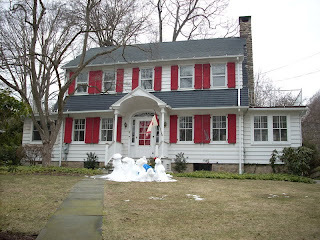 Snow may also build up and run behind the roof flashing causing leaks. Heavy rains can have this effect as well. The majority of flat roof leaks are due to the failure of the flashing, so flashing needs to be inspected and repaired frequently, as it should be on pitched roofs too. Water in any form is a builder’s foe and most builders feel that flat roofs are like skylights; Both are architecturally pleasing and both will leak sooner or later without frequent maintenance. Flat roofs are cheaper than sloped roofs. For flat roofing cost, see my post Roofing Cost Estimator. When on a flat roof, there is less chance of falling. Flat roofs are architecturally pleasing. A Flat roof allows flexibility in 2nd floor window placement as can be seen in the photo below. Flat roof leaks are more common than pitched roof leaks. Frequent flat roof maintenance is required. Flat roof repair is more expensive than a pitched roof. Flat roof replacement is more expensive than a pitched roof. Flat roofs are harder to vent see my post Flat Roof Ventilation. A little higher maintenance for a flat roof perhaps, but sometimes some things are just worth it.